Ministry of Internal Affairs of Georgia has released a detailed data about foreign visitors to Georgia. Tourists from Armenia, Azerbaijan, Turkey and Russia are leading the list and only 5% of visitors are from the EU. 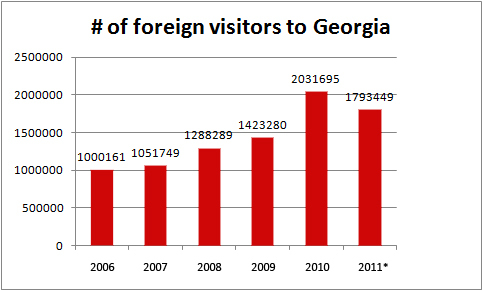 According to MIA, 1,793,449 foreign arrivals have been recorded in January-August, 2011 (2,031,695 people traveled to Georgia in 2010). Most of them were from Azerbaijan – 456,282, 455,611 from Turkey, 448,374 from Armenia and 176,090 from Russia. 2011* - Indicates number of tourists for the January-August period. 1) There are lot of fake Georgian profiles. Because of this, percentages might be insignificantly different. 2) Many people mentioned in this infographic are represented by more than one page. Ones with highest number of fans have been selected for this statistics. 3) All images are copied from the above mentioned pages. 4) Not all the pages are official. 5) Information is gathered through various sources, like Facebook’s advertising statistics, Socialbakers, Alexa.com and many others. 6) Latest information on the internet penetration was released in 2010. Probably, the number is higher today but it is unknown. 7) The calculation of Facebook users by the end of 2011 is based on the growth of Georgian users for past 6 months and is based on the assumption that the growth will continue. It took me 3 days, 2 cups of coffee, thorough research and 70 Photoshop layers to compile this infographic. Let me know if you have any additions, suggestions or questions. On July 29 – August 1 Black Sea resort Batumi hosted the first international Bike festival in Georgia. The festival featured various events, including contests, Rock music concert, tour in mountainous Adjara and etc. More than 200 bikers from Georgia, Turkey and Armenia participated in the fest. There are moments in life when things are very simple and ordinary until you realize that they are awesome. You go to a meeting or a date, you meet some people chat with them, drink, eat or smoke and do not pay attention to lot of things which hit your head only after you leave. It was another hot Friday evening in Washington DC, full of people walking around the Dupont Circle who were going to bars, clubs and other places. There was a little meeting around a very little aluminum table in front of the circle. They were three, representing: Georgia, Armenia and Azerbaijan. They did not eat but drink. One was a refugee from Armenia, another one was IDP from Abkhazia and third one just moved from London to Yerevan long time ago. They spoke about Caucasus. A lot. They shared their personal stories and discussed them from a regional point of view. They spoke about its past, present and the future. Discussion and entire evening went smoothly and harmonically, they listened to each other expressed their opinion and gave suggestions. This does not happen that often, especially with representatives of Armenia and Azerbaijan. Even though these countries are tiny and they are next to each other there is less interaction than it should be. 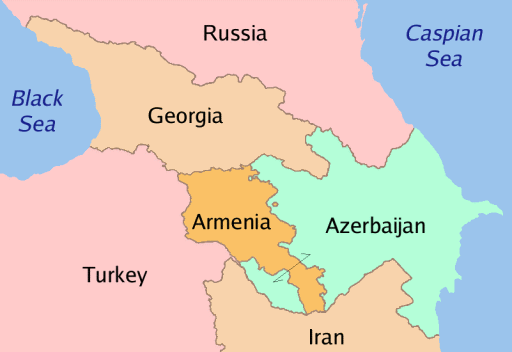 One who came from Yerevan kept saying that Georgia is one of the key places where Armenians and Azerbaijanis actually do meet and talk. But here they were in the capital of USA talking about peace. “It’s so interesting I came to Washington DC from Yerevan, from Caucasus and here I am sitting with Caucasians” said the one who flew from Armenia for a conference on Blogs and Bullets organized by USIP. He promised her to visit her village of origin in Armenia and also told him that whenever he has a chance he will visit Abkhazia too. They said several jokes (you should know it, humor is one of the essential characteristics of Caucasus, and if not most, half of the jokes are about the region). He said that he would love to have an opportunity that Armenians and Azerbaijanis have, meaning he would love to meet current citizens of Abkhazia, talk to them, hear news about his hometown and etc. But here they were in the middle of Washington DC speaking about peace and the future of the region. Suddenly it started to rain, she said she loves storms, he said he does not, even though he was born and raised in London. Third one did not express his idea. There are moments in life when you prefer to keep silent, to listen and realize how awesome that moments are, there are moments when you hear “enemies” speak, when you realize that it’s so easy to destroy all the stereotypes and speak with your foe, with a person you thought only bad things about. There are moments when after realizing all these you would love to speak to your “enemy” and hear what he/she says. There are moments when you dream of the moment when you have an opportunity to meet your “enemy” and shake his hand and listen to him/her, but you know that it has been almost 20 years since you last had such a moment. Around the table were Zamira Abbasova, Onnik Krikorian and Me – Mirian Jugheli. Support this blog, flattr it!